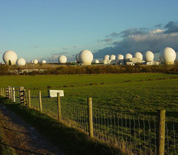 Royal Air Force (RAF) Menwith Hill is a Royal Air Force station in North Yorkshire, England. The 421st Air Base Group provides the majority of support services but the base is commanded by an officer of the RAF. The main mission on base is to monitor communications and provide intelligence support service to the UK and the US. This RAF Menwith Hill directory features the critical info you’ll need to navigate through the many facilities and recreational opportunities available on base­­.